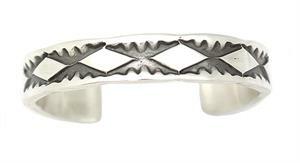 This heavy stamped sterling silver bracelet has a satin finish to it. It measures approximately 1/2" wide and is handmade by Navajo artisan Nora Tahe. Stamping will vary, you may not get what is pictured. They measure 6" wrist with a 1 1/8" opening.